Mechanicsburg’s Francys King completes a double play from her knees on Tuesday against Triad. King dove from her pitching circle to catch a popped up bunt and threw the runner out before she tagged up at first. Triad’s Austin Bails (right) steals second as Mechanicsburg’s Brooks Tom leaps into the air to prevent the throw from sailing into the outfield on Tuesday. MECHANICSBURG – Triad defeated Mechanicsburg, 10-5, in OHC baseball on Tuesday. The Cardinals put up four runs in the first inning and led 7-3 after three innings, scratching across another three runs in the top of the seventh. Logan McCoy was 2-for-4 with 2 RBI and 2 runs scored for Triad and Austin Bails was 2-for-5 with 2 runs scored. Batai Lease got the win, going six innings with three earned runs and 9 strikeouts. For Mechanicsburg, Aaron Conley was 1-for-3 with 2 RBI and took the loss. Logan Hurst was 1-for-3 and Noah Wolf was 1-for-3. In the jayvee game at Triad, Mechanicsburg won, 13-7. Triad lost to West Jefferson, 8-0, in OHC varsity action on Monday in North Lewisburg. The Cardinals were held to one hit by Dylan Warner in that contest. Triad (1-3) travels to Indian Lake on Thursday while Mechanicsburg (1-1) hosts West Jefferson on Friday. 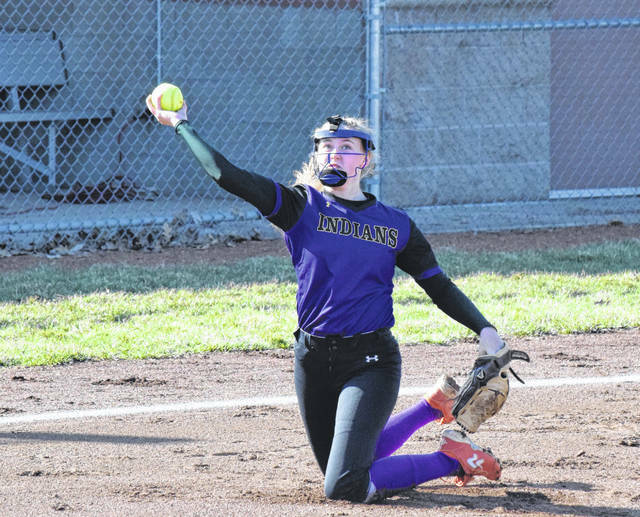 MECHANICSBURG – Mechanicsburg defeated Triad, 2-0, in OHC softball on Tuesday. The Indians put two runs across in the fifth inning to earn the win. For Mechanicsburg, Francys King was 2-for-3, Hanna DeLong was 1-for-3 with a double and an RBI and Macy Reed was 1-for-3 with an RBI. King went the distance in the circle, allowing four hits and walking two while striking out 12. For Triad, Olivia Butz and Shelby Sheets were each 1-for-2. Kendell Hughes was 1-for-3 with a double. Joni Russell took the loss, striking out 8 over six innings. Triad (2-1, 2-1) hosts Urbana on Thursday while Mechanicsburg (3-1, 3-0) hosts West Jefferson on Friday. WEST LIBERTY – West Liberty-Salem beat Northeastern, 8-1, in OHC softball on Tuesday. For the Tigers, Hallie Strapp was 2-for-3 with 2 runs scored, Kayle Henderson was 2-for-3 with a pair of doubles, 2 RBI and a run scored, Olivia Milliron was 2-for-3 with an RBI and Kelsey Day was 2-for-4 with 2 RBI and a run scored. WL-S (3-3, 1-2) travels to Northwestern on Thursday. Bellefontaine defeated Urbana, 12-11, in CBC/MRD softball on Tuesday. The Hillclimbers had a 10-1 lead, but couldn’t hold it. For UHS, Maleah Murphy was 3-for-4 with 2 RBI and 4 runs scored and Mara Donohoe was 3-for-5 with 3 RBI. Urbana (0-4) hosts North Union today. ST. PARIS – Graham defeated Indian Lake, 8-2, in CBC/MRD baseball on Monday. The Falcons put four runs across in the fourth inning to open the game up, doing most of the damage with the bottom of their lineup, as hitters two through five went a combined 1-for-13 on the day. For the Falcons, Chase Adams was 2-for-3 with 3 RBI, Lane Smith was 1-for-3 with 2 RBI, Josh Dooley was 2-for-3 with a double, Caleb Horner was 3-for-3 with 2 RBI and Logan Anthony was 1-for-3 with a double. The Falcons (3-1) travel to Indian Lake today. SPRINGFIELD – Northwestern defeated Urbana, 4-1, in CBC boys tennis on Tuesday. In first singles, Ethan Burnside won, 6-3, 2-6, 10-3. Second singles saw Ethan Headlee drop a 7-5, 6-3 contest. Jacob Coffey lost, 7-5, 6-4, in third singles. In first doubles, Riley Johnson and Michael Trudo lost, 6-0, 6-0. In second doubles, Zach Hoskins and Kyle Rooney lost, 6-0, 6-1.
https://www.urbanacitizen.com/wp-content/uploads/sites/36/2019/04/web1_FrancysKing040219.jpgMechanicsburg’s Francys King completes a double play from her knees on Tuesday against Triad. King dove from her pitching circle to catch a popped up bunt and threw the runner out before she tagged up at first. 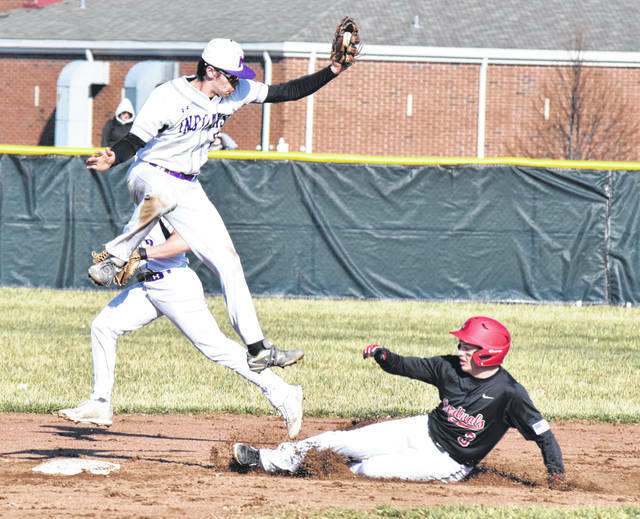 https://www.urbanacitizen.com/wp-content/uploads/sites/36/2019/04/web1_TomBails040219.jpgTriad’s Austin Bails (right) steals second as Mechanicsburg’s Brooks Tom leaps into the air to prevent the throw from sailing into the outfield on Tuesday.